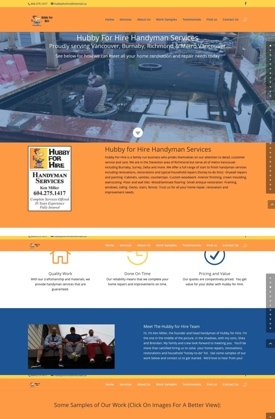 I also recently designed a one page website, Hubbyforhire.ca. With this design, there are multiple sections within one website page. This site features a hero image, before and after, about sections, animations and more. This design is popular now because people can conveniently scroll down to read each section from their smartphones, which they’re increasingly viewing websites from these days. Note though, with a one page web design, it’s harder to optimize this design for local SEO (search engine optimization) due to the one page’s different sections.